Peace Horse Learning & Development﻿ combines my passion for horses, enthusiasm for education of both horse and human and my desire to help others discover the many benefits of spending time in the presence of horses. What we do is offer unique learning opportunities to help you reach your goals. Whether your goal is to build a better relationship with your horse through our workshops or horse/rider develpment programs or you are traveling down the path of personal discovery, building personal and professional skills through our Equine Assisted Learning (EAL) programs, Peace Horse Learning & Development has much to offer you! The mission of Peace Horse Learning & Development is two-fold: 1) we seek to offer quality, evidence-based equine assisted learning programs, and 2) provide information and support to assist you in developing your own equine-focused programming. The vision for the Peace Horse Learning & Development is to provide unique and engaging learning opportunities, and program development with a special focus on work with horses with the goal of improving the lives of all who come to us along their life path. As a horse professional, Cheryl has worked in the horse industry for more than two decades and has been involved with horses for most of her life. She has trained and shown multiple breeds and disciplines, worked at two major Thoroughbred farms in Central Kentucky as well as worked an an assistant to an equine veterinarian. 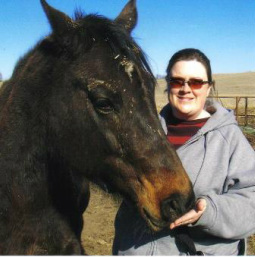 Equine Assisted Therapy and Learning Cheryl combines her horse experience and her Bachelor's and Master's degrees in social work from Western Michigan University to provide a unique skill set to the field of EAP/L. Cheryl is trained in research, evaluation and professional program development and has taken a special interest in education for equine therapy professionals. The focus of her MSW degree was program planning and implementation with a keen eye toward creating effective, evidence-based programming.